Finally to the film everyone is waiting for, well at least one of the film that I really wanted to see of the year and indeed it is the latest from the stylish and crime expert genre director – one and only one Johnny To. 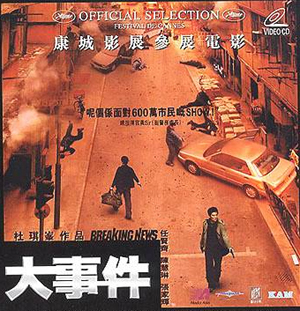 Fresh from the Cannes Festival, To presents us – Breaking News starring Taiwan superstar Richie Ren (Life Express (2004)), the ever pretty girl – Kelly Chen and the newest actor to gain To treatment – Nick Cheung (My Computer Can Speaks (2004)) back in his TVB serious acting mode. After last year disappointing PTU, although it won numerous award, honesty it wasn’t that good, well at least it is not good for a Johnny To’s standard movie and no where near his best crime movie – Running Out of Time. However, with Breaking News, To is back and back to his best, well at least for most of the running time, his trademark is everywhere and his movie provides a message to tell the public about how police are just as determine as politician to give a good media coverage and reputation where they will go to the extent to lie about the real happenings and even use a director to stylise the police action. As I say before, To is back to his best, but the ending was not surprising as other To’s movie that left me thinking and thinking which can be considered as a bit of a disappointment for To not being able to finish it off. The story goes like this When an ambulatory TV news unit live broadcasts the embarrassing defeat of a police battalion by five bank robbers in a ballistic showdown, the credibility of the police force drops to a nadir. While on a separate investigation in a run-down building, detective Cheung discovers the hideout of the robbers. Cheung and his men have also entered the building, getting ready to take their foes out any minute. Meanwhile, in order to beat the media at its own game, Inspector Rebecca decides to turn the stakeout into a breaking news show. Sounds like a good comment on society nowadays and the extent that police will go to for a good media coverage. What all these mean is that the world is full of uncertainties and that although the police are protecting humanity and fighting for a course, what distinguish them from good hearted robbers. Director To stylish direction of the action sequences is always breathe taking to watch and if Wong Kar Wai is the arthouse drama expert, To is the crime version of him. Although the film is based upon 3 main characters, almost none of the three can gather sympathy from the audience as their past are hardly portrayed through some very stiff acting from Nick Cheung and especially Kelly Chen. But the one that steals the show of the three leads will be Richie Ren who portrayal of a bad guy is one with extreme depth and the way you see him kill policemen in one scene and saving a life in another is fascinating to watch and his grin and smile on one and brutal killings expressions in another is that show potential to be a much better actor. Kelly puts in a better than normal performance, in a role that doesn’t really demand much, but this is by far her best acting to date even surpassing her next best performance in last year’s Infernal Affairs 3. She is stiff, but is naturally beautiful which made her very easy to watch, but as far as acting chops are concern she still have along way to go, but the final sequence of her face looking at Ren is one that really attempts to be layered with emotions. As to Nick Cheung in an all serious role, his performance is at best alright and does not standout at all. In fact his character is not even that important at all which is rather ironic as he is constantly on screen. While not as annoying as he was in Tricky Master 2000 he is no where near his best when he was acting seriously in TVB in those tricky and villainous role. However the one actor that is the best of all of the cast is Lam Suet’s short but memorable role and if he is nominated for a Best Supporting Actor in HK Awards here I will not be surprise as he is just so natural in his portrayal of a true coward. Simon Yam also make a short cameo which he has nothing good to do, so he is not worth mentioning I guess. Breaking News is not a film that will break new grounds, but one that is actually quite original as most To’s films are, and his films has this unique energy within it that force the viewers to be glued to the screen. To in PTU was not commercial enough and his film making in that film is at times too subtle but here, the film is very gripping and also very accessible. However the disappointing ending at least in my opinion almost ruin the movie for me, as the usual twists did not happen and all the tension built up from its smart and stylish direction is seemingly wasted. Well, leaving the ending aside, Breaking News is probably one of the best film of the year, ranking right alongside A Nite in MongKok and Jiang Hu, but as far as originality be concerned, few can challenge Johnny To incredible mind. If not for the bad ending, the movie would have easily been the best of the year and a easy 10/10 rating, but because of the ending, a 9/10 is much more probable. Overall, Breaking News confirms that To is back to his best, and it is without doubt not a perfect film like Running Out of Time, but it is definitely a par better than PTU. Johnny To – can’t wait for your next film!